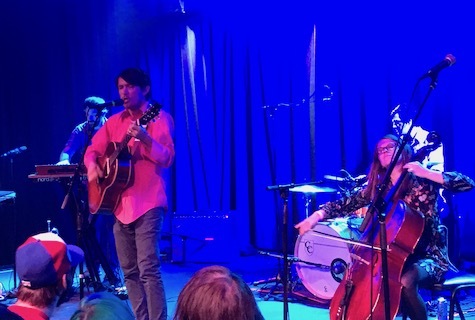 I don’t have much of a review of last Friday night’s Tim Kasher show at The Waiting Room, as five songs into the set I started feeling sick, which stuck with me the rest of the weekend. What I did see of Tim and his crew was the usual awesomeness we’ve come to expect with everything Kasher is associated with. I got to hear in a couple new songs from No Resolution, which seamlessly slipped in with the rest of his oeuvre, and which the crowd, which I’d guestimate at around 150, loved. Allison Weiss at The Waiting Room, May 12, 2017. I did get to see Allison Weiss’ entire set. Despite being your typical solo-with-guitar performance, Weiss managed to grapple the crowd’s attention to her sweet, sad, personal folk songs about relationships gone wrong. Weiss had no issues with letting her emotional baggage hang out, and while that could have been a real drag, she punctuated her songs and her set with wry humor and witty observations and a relaxed manner that said everything’s going to be all right. Among the highlights was a fetching cover of Robyn’s “Call Your Girlfriend” that turned the techno ballad into a personal statement. Watch out for this one. That’s not all I saw this weekend. I was surprised to find two punk acts performing at Brothers Lounge Saturday night. One was a dude doing a solo performance with electric guitar that kind of reminded me of a young version of David Byrne. The other was a keyboard/synth duo that played pounding new wave. I don’t know who either of these acts were, but I dug it while I sat in the corner catching up with an old high school pal. Speaking of The Brothers, the club has a huge show tonight. Austin punk band Xetas is on the bill. They’ve got a new album out on 12XU Records called The Tower that is absolutely relentless. Check it out via Bandcamp below. Thanks to everyone who emailed, Tweeted and Facebooked an entry into the drawing for a copy of the Lazy-i Best of 2015 Comp CD. This was the largest number of entries received in years! Your CDs will be in the mail in the coming days. Thanks for playing, and for reading Lazy-i. Jazz dude Luke Polipnick says goodbye to Omaha tonight via a special concert by The Delve Trio at Pageturners. Where he’s going is anyone’s guess. The free show starts at 8 p.m. Tomorrow, we gaze into the crystal ball at 2016 music predictions!!! Don’t miss it. 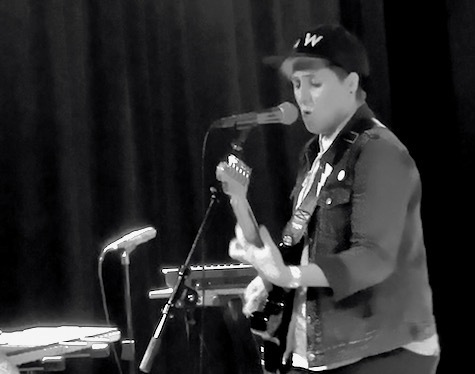 Digital Leather at O’Leaver’s, Sept. 19, 2015. The band returns to O’Leaver’s tonight. Of Montreal returns to The Waiting Room tonight. If it seems like they were just here that’s because they were. They played the Waiting Room this past March. If you’re wondering what they’re going to play, here’s their set list from their Saturday night show at Wooly’s in Des Moines (which helps me not at all as I couldn’t tell you the name of one of their songs). Opening is Diane Coffee. 9 p.m., $18/$20. 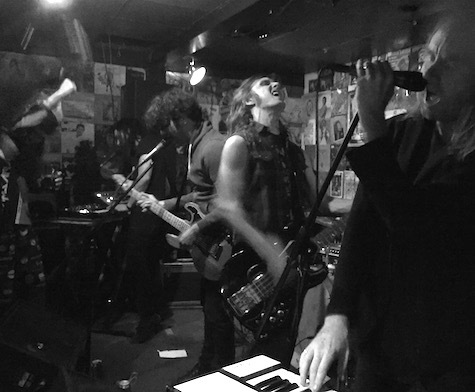 Also tonight, Digital Leather does a warm-up set at fabulous O’Leaver’s before they hit the road on tour, eventually meeting up with Desaparecidos Nov. 11 for eight dates plus the sold out O’Leaver’s show Nov. 22. Could this tour be the big break DL’s been waiting for? BTW, who else saw that photo in Facebook of Denver Dalley standing alongside none other than Bill Murray? Goddamn, what next? Denver sharing a PBR with Obama? Anyway, DL I believe is headlining this show, which also features Austin band Xetas, whose new album The Redeemer came out on Gerard Cosloy’s 12XU Records. Opening the gig is Mike Schlesinger. $6, 9:30 p.m.